I'm try to build a cheap pressure transducer to use with my cheap Hantek 1008c scope for automotive measurements. When I started taking measurements and testing it, I saw a 40mv peak to peak, approximately 1kHz sine wave riding on the output signal. I think this is just noise from a cheap transducer, but I got curious as to how I might eliminate this noise. I'm using this 30psi transducer ( and a 200 psi one ), plus a Drok 2203 buck converter for power. The transducer has three wires, power, ground and signal. It expects 5v, and linearly outputs from 0.5v at 0 psi up to 4.5v at 30 psi. It's ground, and that of the BNC connector which goes to the scope are both hooked up to the Drok's ground. I've already checked the power supply and it's giving a clean 5v. I decided to try shunting the AC component to ground using a capacitor between the signal wire and 0v ref, and after experimenting found that a 0.1uF mylar cap worked best, although "best" only reduced the amplitude of the sine wave noise by about 40%. So I'm curious how one could completely eliminate noise like this? Here are a before and after. I tried inserting images, but couldn't so just linked to a 50 sec vid. I guess there was some kind of aliasing going on at the higher timebases. So is this 400 kHz sine wave just a defect in the transducer as I suspect, and is there anything I can do to get rid of it completely without affecting the rest of the signal? I got the same result when I inserted the RC LPF right on the output of the buck converter. The best LPF results were with a 47 Ohm resistor and 1uF cap. 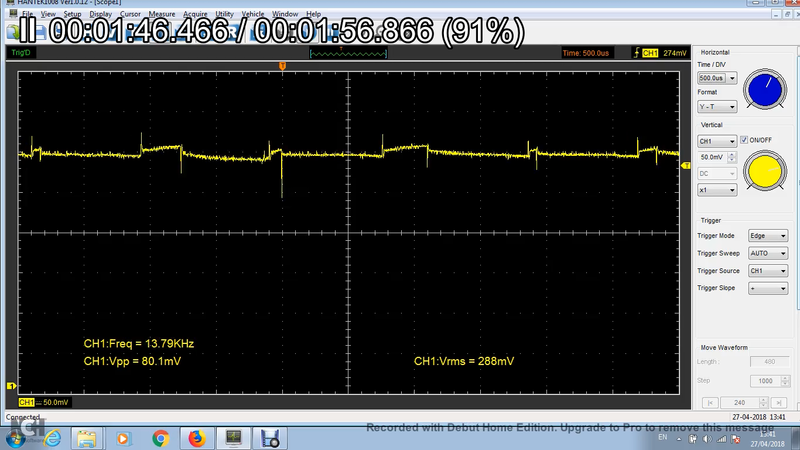 It reduced the amplitude of the buck converter noise to only 3mv, without noticeably reducing the signal voltage, which is completely acceptable. I may use the 4.5 volt battery, or the buck converter with the LPF, either way I'll need to get a better quality pressure transducer. Seems like you are seeing noise from the switching power supply, since 400kHz is a plausible switching frequency. As well as bypassing the output you can try connecting capacitors across the input to output. 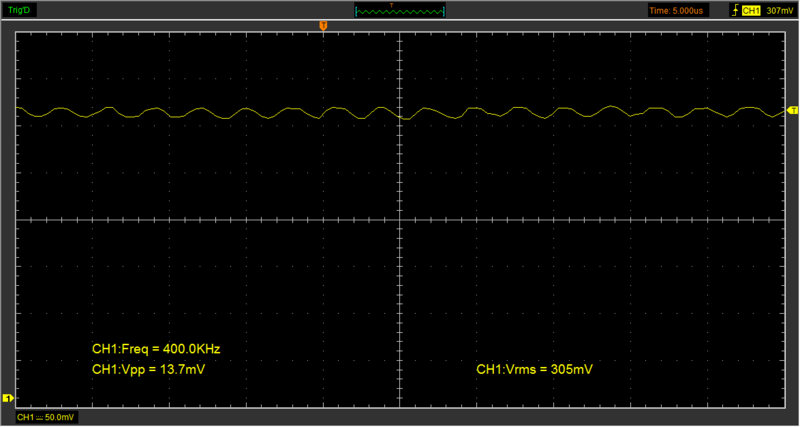 A simple RC low-pass filter will get rid of most of it at your scope without affecting the millisecond-level rise time of the sensor appreciably. If you are curious as to why (real) 400kHz noise would show up as a (not real) 1kHz sine wave, it is because of a phenomenon known as aliasing. Not the answer you're looking for? Browse other questions tagged capacitor ac noise or ask your own question. Power line voltage out of phase with ambient 60Hz electrical noise - why? How to calculate appropriate value for noise-removal capacitor?